Entering their final regular season game—a road contest against Maine at Alfond Arena—the Terriers are a win away from clinching home ice in the Hockey East playoffs. Lowell’s Friday night tie with Vermont leaves the River Hawks two points ahead of BU for fourth place. If BU defeats the Black Bears, they’ll hold the tie-breaker by virtue of one more conference win. Maine is already locked into the #6 spot. A victory would also allow BU—14-15-4 but currently on a five-game unbeaten streak (4-0-1)—to reach .500 overall. Puck drop tonight is at 7:30 p.m. with a live stream available from Maine All-Access. The teams split a pair of games in Boston in November, with BU winning 3-2, followed by a Maine 3-1 victory. The game matches two of the hottest goalies in Hockey East. Two weeks ago, BU’s Jake Oettinger and Maine’s Jeremy Swayman shared the Defensive Player of the Week award. Swayman was the conference’s Goalie of the Month for February, posting a 1.85 GAA and a .946 save percentage in seven games. Oettinger has yielded just six goals in his last six starts. Maine’s offense is led by Mitchell Fossier with 34 points and Chase Pearson with 28 including a team-high 15 goals. Two of his goals came in Maine’s 3-1 win at Agganis Arena. 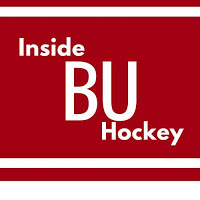 Episode 18 of Inside BU Hockey features Bernie Corbett’s interviews with Head Coach Albie O’Connell and sophomore forward Gabriel Chabot. 2019 recruit Ethan Phillips scored his 12th goal in Sioux Falls’ 7-4 win against Chicago. Robert Mastrosimone tallied his 24th goal for the Steel. 2019 recruits Dom Fensore, Alex Vlasic and Trevor Zegras each recorded an assist in the NTDP U18s’ 6-5 shootout loss to Lincoln. Drew Melanson scored his first AHL goal in Hartford’s 3-2 shootout win against Wilkes Barres/Scranton. 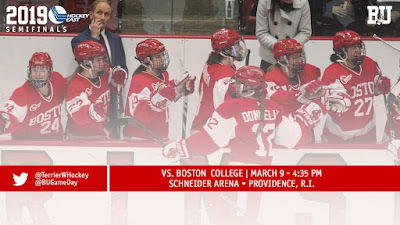 #8 Terriers take on #6 BC in the semifinals of the Hockey East Championship today. Puck drop for the contest at Schneider Arena in Providence is set for 4:35 p.m. It airs live on NESNplus. The victor will meet the winner of the Northeastern-Providence semifinal in Sunday’s title game. BU, which has reached the semifinals 11 times in 14 years, will seek to claim its record sixth tournament championship. The Terriers claimed the regular-season series against the Eagles, 2-1. BC took a 3-2 victory in November and then BU swept a weekend series with 3-2 and 4-2 victories. For BC, Megan Keller and Daryl Watts lead the offense, each with 42 points and 19 goals. Goalie Maddy McArthur has a 2.02 GAA and a .912 save percentage. Jesse Compher sits atop the BU scoring chart with 60 points—3rd best in Division 1 as well as second in assists with 43. Sammy Davis has 52 points including a team high 25 goals, followed by Abby Cook with 27 points, and Mackenna Parker with 19. Corinne Schroeder has a 1.80 GAA and .936 save percentage. 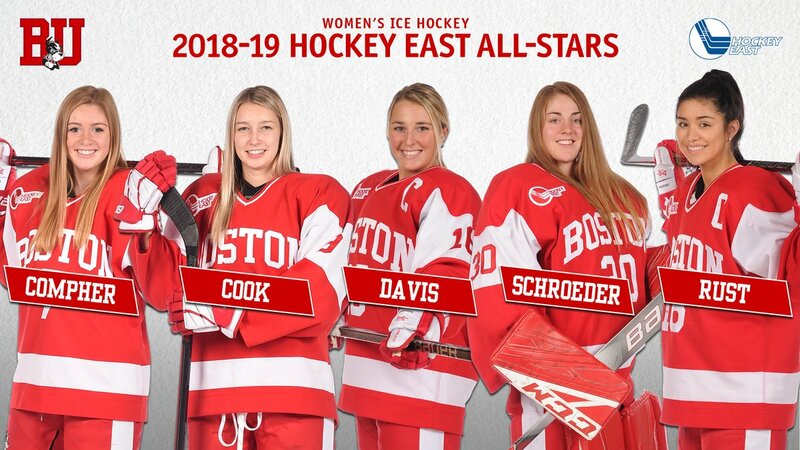 Five Terriers have been named to Hockey East’s all-star teams. Compher earned first team all-star honors. 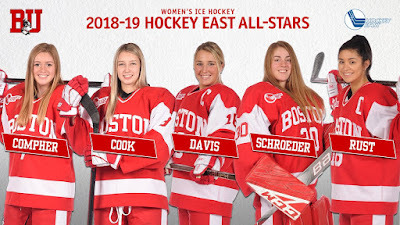 Davis and Cook were named to the second team. Schroeder made third team, while senior Reagan Rust earned honorable mention.